As a writer, Michael Dougherty is known for injecting “X2: X-Men United” with just enough adamantium and for strapping the script of “Superman Returns” to a certain green rock and locking it in a lead-lined box. Both films were directed by Bryan Singer, who, as a producer for this film, is clearly helping out his friend. As are the actors. Anna Paquin and Brian Cox (both “X2” alum), have offered their talents for Dougherty’s feature-length directorial debut. While these elements attracted me to this film, what sold me was how it appeared to be about or take place on Halloween, an angle that became all the more alluring. What we have here is a wicked and inventive anthology horror film, which – for the most part – will please macabre fans. The characters introduced in these stories are revisited and expanded upon throughout the film. It’s a refreshing alternative to all the horror sequels and remakes we’ve seen over the past decade or so. The film takes place in a small Ohio town where a huge Halloween street party has become the main event. Everyone is in costumes, music is being played and practically all of townspeople in the neighboring homes are passing through. We’re introduced to Emma (Leslie Bibb) and her husband Henry (Tahmoh Penikett) as they return home in full costume from the street party. Emma isn’t a huge fan of the holiday’s respective customs or traditions and as Henry warns her, winds up paying for it dearly. 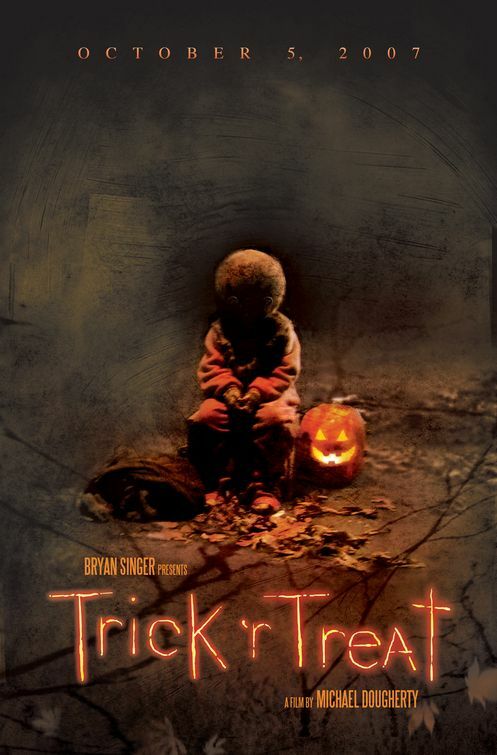 While kids are still enjoying their trick or treating adventures, we’re introduced to the local elementary school principal, Steven (Dylan Baker), whose mysterious deeds are kept within the privacy of his own home. For now. There’s also a group of children that come across as do-gooders at first, but once they visit the eerie spot of a local legend, then we’re left to wonder whether they deserved what was coming to them. We then meet Laurie (Anna Paquin), a supposed virgin in town with some girlfriends who try and lure the local boys. Finally, there’s Mr. Kreeg (Brian Cox), a reclusive old hermit, is left alone to fend off an attack by a nasty little devil named Sam. Throughout all these stories, we see how they intercut and impact each other, be it past or present. 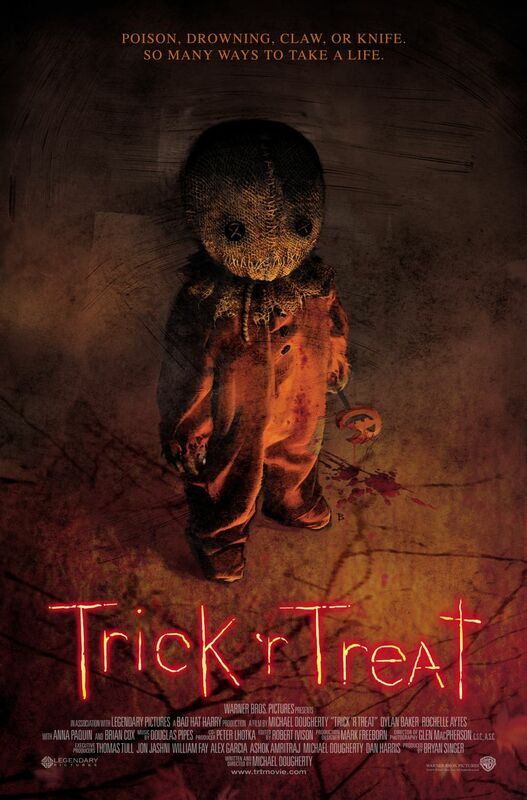 “Trick ‘r Treat” is in the same vein of the beloved horror comics from long ago, which finds the feature resembling the “Creepshow” movie (a franchise that, unfortunately, kind of died off). Dougherty distinctly lays off any gratuitous stylistics that might yank the viewer out of the experience he provides. The tone of the film is unexpectedly fluid though, moving back and forth between laughs and scares with a remarkable ease, considering this is Dougherty’s feature-film debut. He clearly has a love for Halloween films, be they cheesy, creepy or legitimately frightening. Here he offers evocative depictions of gruesome Halloween horrors, choosing to steer clear of camp or repellent violence. The latter is quite an accomplishment one we discover just what considering what the Principal Steven on the holiday. For a change of pace, “Treat” can be seen as more of an assault to the senses, but in the best way possible. It maintains a respect for the material, yet does so in a cautious and meticulous manner. As a screenwriter, Doughtery relies on differing stories that play off Halloween traditions and urban legends, Dougherty cleverly connects the various plots, using time and suspicion to continuously taking the film in fresh directions. There were several turns that I just didn’t see coming and for this genre, that is most welcome. Thankfully, the cast is quite game and able to take on some sensitive genre tropes with the right amount of zeal. Baker is spot on in his roll. He’s able to give his depraved character arc (apparently why the film was shelved for two years by Warner Brothers) both a horrifying unsettling and unpredictable vibe, yet oddly relatable. Treat” might be seen as slight or quaint, but that’s would be unfortunate. As it cheerfully embraces the treasured multiple story format that is all but forgotten, its a real treat (pun intended) and definitely offers something different. As far as the connecting element (or character), that would be the mysterious teenager, Sam (Quinn Lord) – otherwise known as Peeping Tommy (sounds as awkward as it is). He’s a slight fellow dressed up in a ratty costume with a burlap sack over his large head. (It’s one of those masks that you just know should not be removed). Sam serves as something of a symbol in each story and maybe even of Halloween itself. Could he be a demon or goblin? Maybe. Dougherty’s use of Sam is reminiscent of a character that would pop up in a Sam Raimi horror flick, one who offers torment and threats in a mischievous manner. I’m not keeping track but this could be one of the best horror films of 2009. Well, actually, it’s distribution timeline is bizarre. It hit some film fests at the end of 2007, as well as some in 2009 and made some promos events at that year’s San Diego Comic Con, since it was announced that it would finally see a release date in October. But, that’s it. Rumor has it the release was pushed back primarily due to the way some of the characters were portrayed, which is kind of odd, since that’s the appeal. Plus, any horror film that references “Trilogy of Terror” is good in my book.